The living wage movement has been successful in promoting ordinances at the city or county level that would mandate covered businesses to pay wages much higher than the effective state or local minimum wage. At least 60 local governments have adopted some type of living wage mandate legislation. A typical ordinance requires contractors and businesses receiving governmental financial assistance to pay a minimum wage ranging from 150 to 225 percent of the minimum wage. The movement has even broader goals, including federal living wage legislation and expansion of wage mandates to cover all low-wage employees. The living wage movement argues that public money should not be used to create jobs that pay “poverty level” wages. This argument has surface appeal, which has attracted a number of religious and charitable organizations to their cause. However, on closer examination, living wage mandates are at best an inefficient and inferior policy vehicle for helping poor families. At worst, they harm poor families by reducing their work opportunities and incomes. A better alternative is a targeted wage subsidy that lifts the income of those most in need without raising labor costs to employers. High labor costs discourage employers from hiring, which means that those workers with limited skills and work experience are likely to be excluded from the job market. Wage subsidies usually are administered through the tax code to provide a tax credit to either employers or workers. An example of an employer-type subsidy is the Work Opportunity Tax Credit that is available to businesses that employ certain types of low-skilled workers. An example of an employee-based subsidy is the Earned Income Tax Credit (EITC) that is available to families with low earnings based on earnings level and family size. Wage mandates raise the cost of hiring and thus may destroy jobs and work opportunities. In contrast, wage subsidies either lower, or have no effect on, labor cost and thus do not discourage, and may encourage, hiring of workers with limited skill. Wage mandates are poorly targeted to low-income families, most of whom have either no workers or only part-time workers. Conversely, many who would benefit from the wage mandates do not need the boost because they are secondary workers in relatively affluent families. In contrast, wage subsidies, by encouraging work, bring their benefits to more poor families than can be reached by wage mandates. Wage subsidies also are more cost-effective than wage mandates because they limit eligibility to those most in need. Wage mandates are not efficient in raising the disposable (i.e., after-tax, after-benefit) income of workers in poor families because much of the gain in earnings is lost in taxes or benefit reductions. Many of the poor receive governmental assistance, such as welfare, food stamps and the EITC, that is phased out as family income rises. Low-income families can lose as much as 90 percent (more in some cases) of wage gains in taxes, lost benefits and refundable tax credits. On the other hand, employee-based wage subsidies such as the EITC provide benefits that either are not taxed or are taxed at a lower effective rate than wages. Also, under current regulations, such subsidy benefits do not cause families to lose as much governmental assistance or tax credits as do wage increases. Based on research into the effects of living wage programs, it is possible to design a local targeted wage subsidy program that would have the same effect on the disposable income of workers in poverty but at much lower costs. A local government could piggyback on the state or federal EITC for the employee base they wish to support. For example, rather than adopting a living wage mandate for contractors, a locality could enact a targeted wage subsidy for employees of contractors who are eligible for the state or federal credit. We estimate that such a targeted wage subsidy could deliver the same benefits as a living wage mandate to workers in genuine financial need at 35 to 60 percent of the budgetary cost of the wage mandate. In a major city such as Los Angeles, this could translate into saving as much as $3 to $7 million annually. This comparison does not even consider the additional wage subsidy benefits of avoiding the loss of jobs and loss of work opportunities. 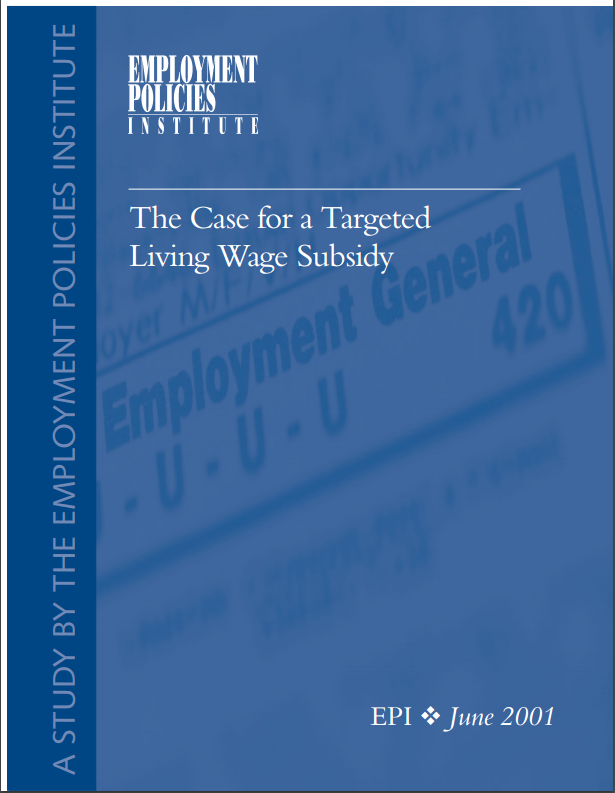 The targeted wage subsidy alternative is more cost-effective for three main reasons. First, based on research on the San Francisco and Los Angeles living wage ordinances, local governments are likely to absorb 50 to 75 percent of the living wage mandate’s increase in labor cost. Second, based on data from the U.S. Census Bureau, less than 30 percent of those workers who would benefit from untargeted mandated higher wages are from families in poverty. Finally, because many of the intended beneficiaries stand to lose governmental assistance when their earnings rise, the wage subsidy allows them to keep more of their benefits, particularly the refundable EITC. Thus, by redirecting the benefits to those in need by a means that is more tax advantaged than wages, the local government ends up paying less for the same gain to workers.